Book 39 in my first 52 books challenge. I was only familiar with Ray Bradbury as a TV scriptwriter until a few years ago when I read a short story by him that appeared in an anthology of funny science fiction stories. Then I found this book while browsing in the Red Cross charity shop in Reykjavik, liked the Shakespearian title, and bought it. It’s been sitting on my TBR shelf for several months and I think it's about time I read it. Will and Jim, two teenage friends who live in a town somewhere in the USA, witness the arrival of a mysterious and creepy carnival in the dead of an autumn night, long after the carnival season has ended. They witness something terrifying in the carnival grounds after closing time and one of them accidentally harms one of the carnival directors, and as a result they are hunted through the town by the carnival people, a collection of twisted and tortured freaks who have themselves fallen prey to the dark carnival and become its slaves. 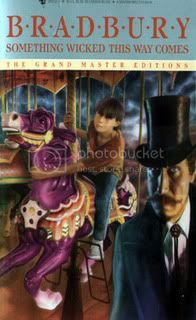 In this book, Ray Bradbury took something that many people these days find innocuous and perhaps a bit tawdry, but which less than a century ago was indeed quite terrifying to any right-minded person: a side-show carnival. Old-time side-show carnivals were full of people whose appearance made it impossible for them to live ordinary lives, and although some of the side-acts were fakes, many were quite real, a pathetic collection of diseased, disabled and deformed people who were put on show like animals in a zoo. Bradbury is old enough to have seen such side-shows and has taken their more nightmarish aspects and woven them into a fine tale of good versus evil. The narrative style is poetic and eloquent, rich, full of meaning and laden by turns with menace and hope. It is hardly the kind of language one expects from a horror story, which makes the horror all the more effective. The freaks are both pathetic and scary, the horror is just as much psychological as it is visual, and while the worst of the bad are pure evil, the good and just have a dark side that sometimes makes it hard for them to judge correctly what is right and what is wrong, and which makes them real and believable. The plot moves along slowly at first and then begins rolling along faster and faster, until it reaches a frenzied climax. Rating: A fine tale of horror and friendship, family ties and things that go ‘bump’ in the night. 4+ stars.